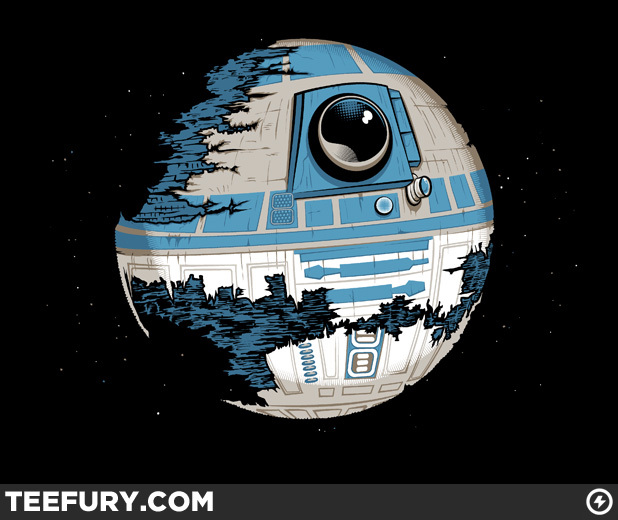 Fruitless Pursuits: R2-Deathstar Shirt at TeeFury! There is something so awesome about this shirt... I just can't look away from it. The Deathstar is such an iconic Star Wars design, and R2-D2 can be so cute sometimes. I love it when R2 is re-imagined in a different shape (video game consoles, mailboxes, atomic bombs) and the Deathstar gets plenty of creative love too (check out this amazing watermelon Deathstar), but the simple elegance of this inter-franchise mashup really hits the sweet spot for me. This shirt is only $10, and available for just 24 hours at TeeFury.com!